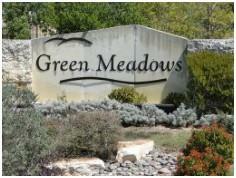 Here are the Active MLS listings of homes for sale Green Meadows Buda. If you have a question or want to see a home in Green Meadows, call Jim at 512.913.1557. Neighborhood Location: From Austin, take Exit 220 from IH-35. Go to the 2nd overpass, then take a left across IH-35. Follow Hillside Terrace (CR-133), then turn left on Old Goforth Rd (CR-119). The entrance to the subdivision is on the right at Green Meadows Rd. The table of MLS market data below provides a snapshot of real estate activity in the Green Meadows subdivision over the past 8 years. Green Meadows Buda real estate market data from the Austin Board of Realtors, 1/1/2011-12/31/2018. All of the homes in Green Meadows were built by Centex Homes. The first home sale in the community (recorded in the Austin MLS) was in November 2006. The neighborhood build-out was completed in 2013. There are a total of 300 homes in Green Meadows that have either 1-story or 2-stories. These homes offer families from 1,185 to 2,645 sq. ft. of air-conditioned living space. Homes in Green Meadows were built with a number of key energy-efficiency features, including radiant barrier roof decking, Low-E double-pane windows, Lennox 14-SEER A/C systems, and 38" attic insulation. Interior features included satin nickel door knobs, cable and phone wiring, raised-panel interior doors, 30" oak kitchen cabinets, Whirlpool appliances and more. Green Meadows has a very nice community park and childrens' play area for their homeowners and their guests to enjoy. For shopping, Green Meadows homeowners have a growing number of options. These include newish developments just across IH-35 (Super Wal-Mart, Cabella's outdoor sporting goods, HEB grocery store, e.g. ), and others to the south in Kyle and San Marcos and to the north in South Austin (Southpark Meadows). There are a number of recently-built restaurants. For recreation, there are some nice golf courses in the area, including Plum Creek Golf Club in Kyle, and Grey Rock GC in the Circle C Ranch development in SW Austin. The public parks operated by the City of Buda feature picnic facilities, playscapes and other play areas. Homeowners must maintain a membership in the Green Meadows HOA. Fees are used for keeping up the neighborhood common areas, including the entry, landscaping and park area. Green Meadows neighborhood students attend schools of the Hays Consolidated Independent School District. Prospective homebuyers and parents should verify current schools with the Hays CISD since attendance boundaries are occasionally redrawn and new schools are sometimes built.